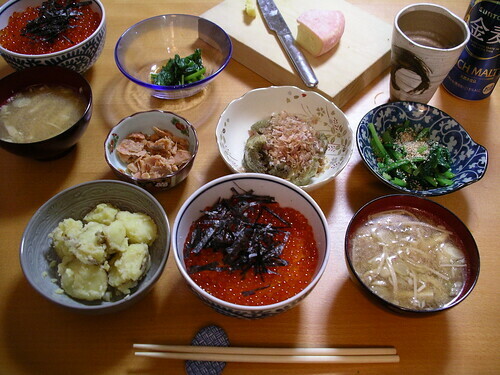 Mentaiko (spicy pollock roe); ikura no shoyuzuke (salmon roe preserved in soy sauce); noyasai no nibitashi (blanched wild greens flavoured with dashi and soy sauce); kyuuri no kombuzuke (cucumbers quick-pickled in salt and powdered kelp); kogomi no itame (sauteed fiddle heads), and hiyayakko (cold tofu) and spinach topped with katsuobushi. 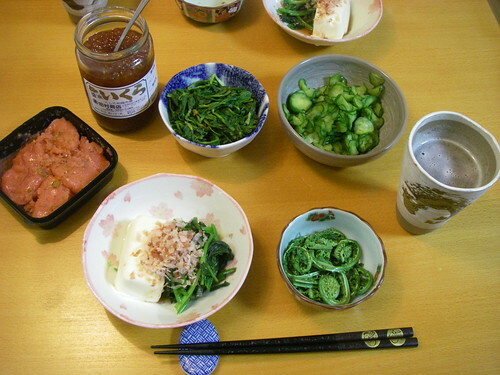 The mentaiko and ikura were gifts from BIL (my brother-in-law), the wild greens (a watercress-like plant of unknown species) were picked by Hideaki in Hokkaido and cooked by BIL, and the kombu powder was also from BIL. 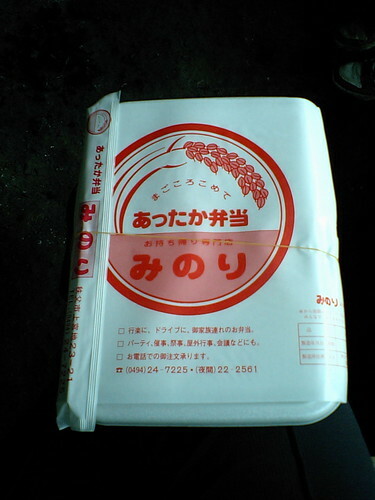 Kombu, like ikura and mentaiko, are a meibutsu (famous product) of Hokkaido. The meal was finished off with white rice (merely a vehicle for the mentaiko and ikura) and two types of salt-grilled fish: sake (salmon) and saba (mackerel), both gifts from BIL. The next day's dinner started off with three Hokkaido cheeses (bought by BIL on a visit to the cheese maker): monvizo, scamorza and tenerello. All were delicious and although on the mild side seemed closer to European cheeses than Japanese, and I never would have guessed they were made domestically if I hadn't already known. The cheese was followed by a salad; the same mentaiko and ikura as before; sliced shiso (perilla) to eat over rice with the roe; a trio of pickles; soramame (fresh fava beans); and more of the the mackerel and salmon from the Hokkaido. 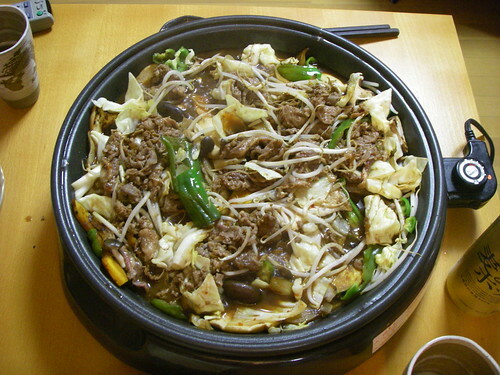 The next Hokkaido-themed meal was jingisukan, the Mongolian hotpot-like dish named after Genghis Khan. 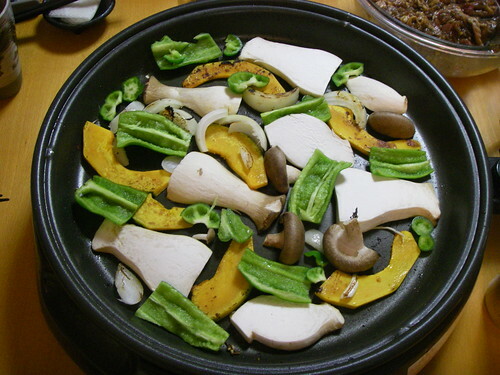 We started by cooking onions, green peppers, kabocha squash, shiitake, and eringi mushrooms on our electric skillet. 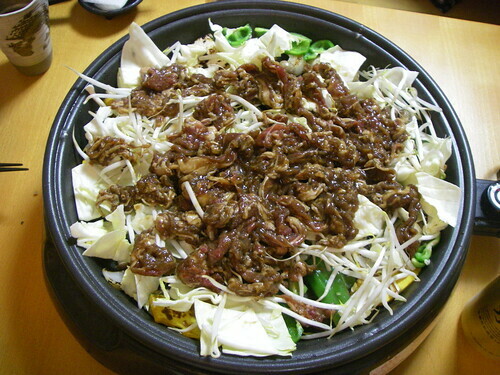 When the vegetables were partly cooked we added bean sprouts and marinated, thinly sliced lamb. The lamb was from--you guessed it--my BIL, and came frozen and already flavoured in a slightly sweet and spicy soy based sauce.. 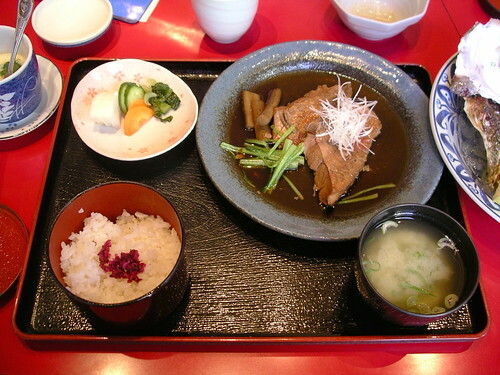 The skillet was covered and the jingisukan steamed until the lam was cooked, then it was stirred up and eaten with rice. We already love lamb and have even made jingisukan at home a few times, but this was the best ever. 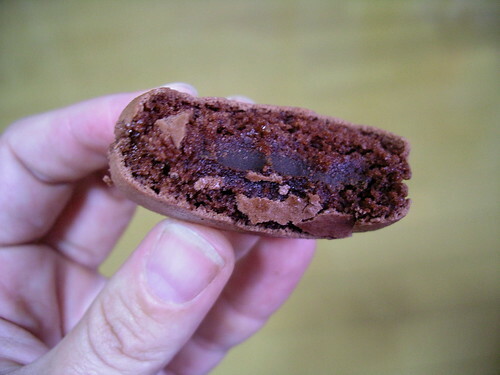 Another BIL souvenir: Sanpouroku, a confection made in Obihiro, west of Kushiro. 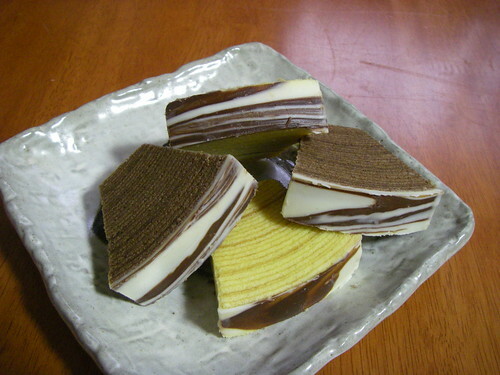 It's a variation of bamukuhen, Japan's version of the German baumkuchen, that takes the resemblance of the cake to a tree (the German name literally means "tree cake") one step further. 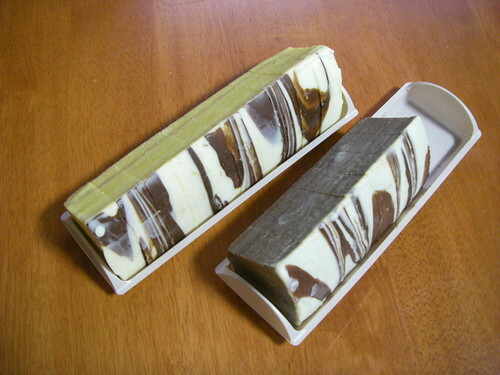 The outside of the cake is glazed with white and milk chocolate in a marbled pattern resembling the bark of shirakaba (white birch), a tree that grows abundantly in Hokkaido. We got one cake each of plain and chocolate, and both were as tasty as they were pretty. 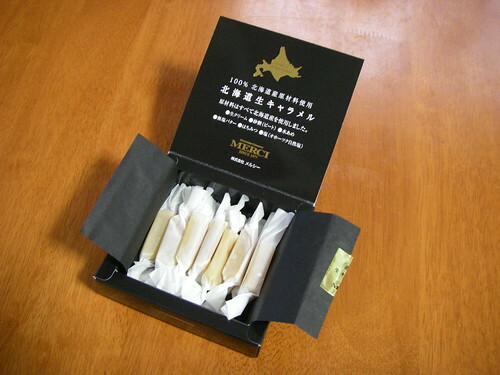 This is something we bought for ourselves, being curious to try nama caramel, Japan's latest sweet obsession. 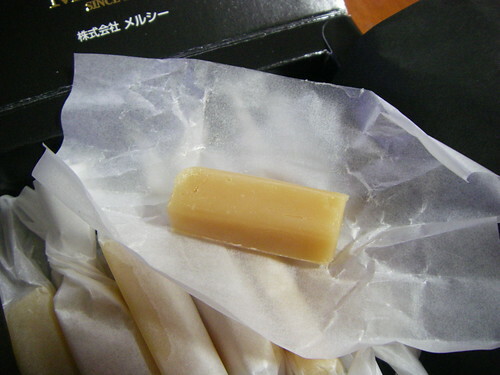 Literally "raw caramel", it seemed to be an arsenal caramel that is very soft and rich tasting, and is usually sold at shockingly high prices. I think we paid about 1000 yen for the box shown above, which is a bargain by Tokyo standards (there were cheaper caramels at the souvenir shops in Kushiro airport but a quick check of their ingredient lists showed that were of inferior quality). It turns out that nama caramel is exactly what we thought: a very rich, soft caramel. It was certainly delicious, and obviously made with quality ingredients, but it's basically just a soft caramel. I don't get what all the fuss is about or why people are willing to pay so much money for the stuff. The last souvenir from Hokkaido was horumon, which means "throw-away bits" and refers to intestines, both beef and pork. It's eaten as horumon-yaki (grilled intestines) and is very popular in Hokkaido. 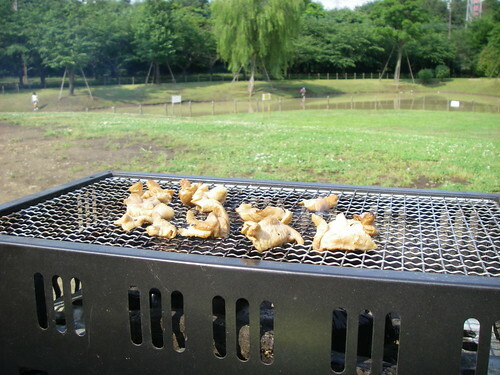 When well prepared it's very good, even for people like me who aren't into organ meats, but it stinks to high heaven during cooking so we decided to have a barbeque in the park to eat it. It came with a spicy dipping sauce, so we cooked it plain, along with asparagus, kabocha and eringi, then dipped it before eating. It looks kind of burnt above, but as it's very very fatty it's better to overcook it a little to let as much fat out as possible and to make it nice and crisp. Luckily we were the only ones barbequing that day (Japanese tend to consider barbeque a summer and autumn thing, so May is not the right season for it), but I'm sure more than a few passersby had to breathe in some unpleasantly flavoured air. Next up: scallops and sazae (turban shell). 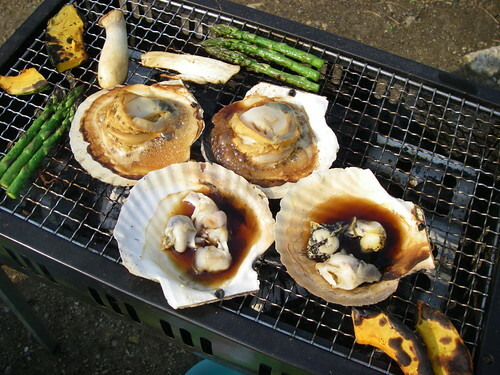 The scallops were left on the half shell and cooked in sake and soy sauce, and the sazae were chopped up and poached in the other scallop shell halves in the same sake and soy sauce. 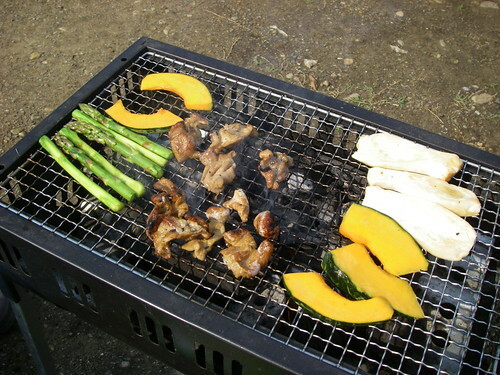 Man, I love Japanese style barbeque! Wanting to return to simpler food, but still not ready to take a seafood break, we went to a local soba (buckwheat noodle) restaurant. 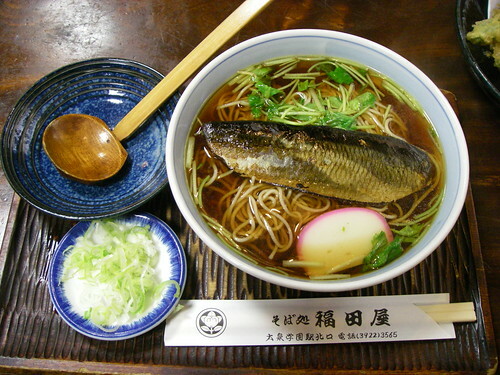 I had nishin soba: soba noodles in hot broth topped with nishin (dried herring) and mitsuba (trefoil), negi (long onion), and kamaboko (steamed fish cake). This is probably one of my favourite ways to eat soba, but I usually only get to eat it on New Year's Eve (soba is a traditional new year's dish, and my husband's family always eats it with nishin). We had a more down-market version of soba at Hanamaru Udon, a popular fast food chain that specializes in sanuki udon (a regional style of udon, or wheat noodles). Hanamaru's main draw is its low prices: it's possible to buy a small, plain bowl of noodles for 105 yen, and although few people could be satisfied by such a small serving, you could still order a larger bowl with a few toppings for well under 500 yen. 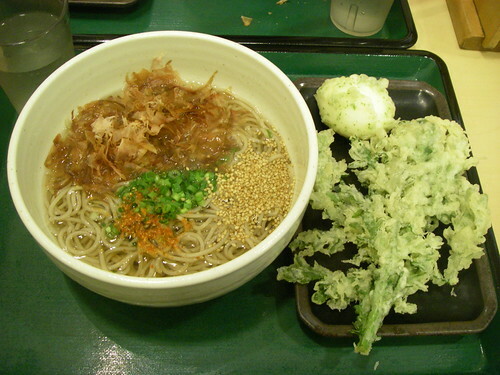 You also aren't limited to udon and can opt for soba instead, which we did on this visit. Above, I ordered a medium sized kake soba (soba noodles in hot broth topped with negi) withe shungiku (chrysanthemum greens) and uzura tamago (quail egg) tempura on the side. At the do-it-yourself topping station I added katsuobushi (bonito flakes), sesame seeds and shichimi (seven spice mix). The tempura is served cold so I usually avoid it, but I make exceptions for things that tend to keep their crunch, like shungiku. 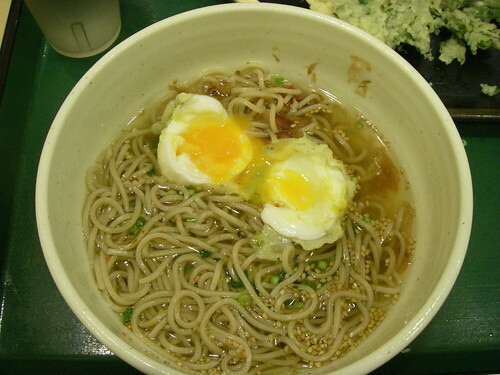 The uzura tamago was recommended by my husband, a Hanamaru Udon regular, as the ultimate noodle topping. He was right. The eggs was cooked hanjuku (soft boiled), and the yolks oozed into the broth to add a rich, sweet flavour. It was a very fancy touch that made my meal seem like I'd paid a whole lot more than 400 yen for it. 400 yen doesn't quite pay for a latte at my favourite Kichijoji cafe medewo and dine (OK, I've only been there a few times, but it's still my favourite). 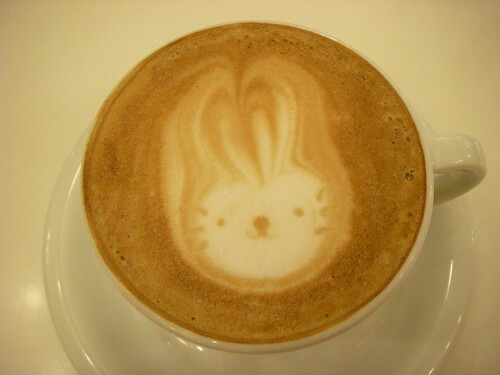 But there's nothing wrong with splurging every now and again for a tasty cup that comes decorated with a bunny. The shrimp dish above is based on Epicurious's garlic shrimp recipe, using shelled shrimp instead of the shell-on shrimp called for in the recipe (I'm not a fan of shelling shrimp at the table, especially in a greasy, messy dish like this) and skipping the garlic chives, which seemed redundant. The shrimp themselves were fantastic and I couldn't believe such a short ingredient list could produce such an amazing flavour. But after a few bites we realized we were going to have way too much sauce left over--we did have bread ready for dipping but we would have needed loaves of it to use up all the garlicky oil. So I boiled some pasta (angel hair--we were too hungry to wait for anything else) and added a few cherry tomatoes and basil leaves, and it became a delicious pasta sauce. 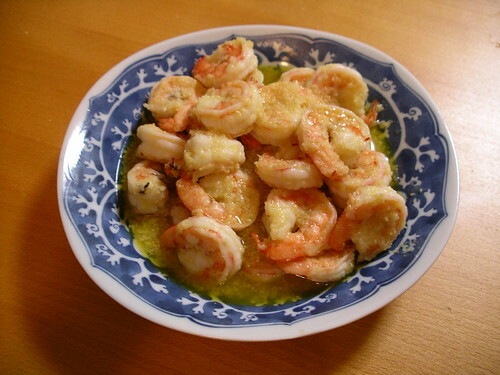 Maybe some day I'll come across whole serrano chiles and reasonably priced long-grain rice in Tokyo, and thus be able to enjoy the original recipe as it was meant to be served, but until then this will be my go-to shrimp past recipe. Sadly I have no idea where I got the recipe for this chilled tomato soup. 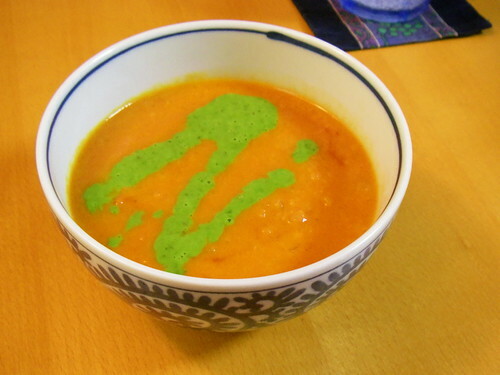 The soup is a slightly chunky puree, perhaps with roasted peppers or other vegetables, and that's basil oil on top, but I've completely forgotten where the recipe came from. It was really good and I remember thinking it would be fine hot as well, so I'd really like to make this again. Can anyone help? 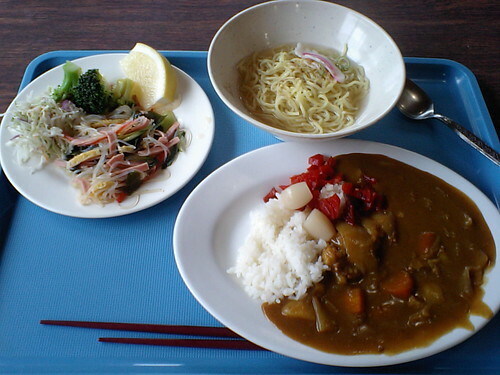 During my five weeks of summer camp I ate lots of kid-friendly Japanese cafeteria food. At one of the camps we cooked all of our own meals, but the other four we made breakfast only and ate at the campsite's cafeteria for lunches and dinners. The food was served buffet-style and was pretty good, with far more vegetables and healthy options than you'd find at a similar place in Canada, but camp counseling is hard work and I was rarely successful with my plans to avoid the fried foods and second trips to the buffet. 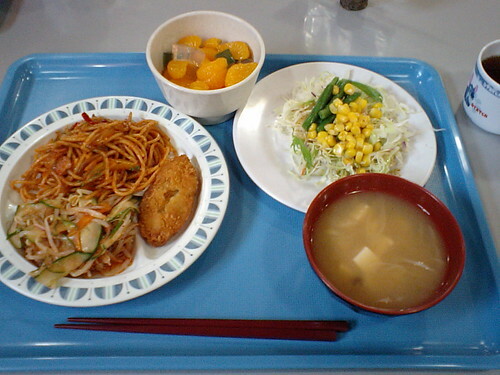 Above, from plate on left: napolitan spaghetti (a Japanese classic made with tomatoes--or more often ketchup--along with onions, green peppers and ham); fried fish of some kind; and marinated cucumbers, bean sprouts and carrots; fruits mitsumame (a dessert of canned mandarin segments and agar jelly cubes); salad; miso soup with negi and tofu. 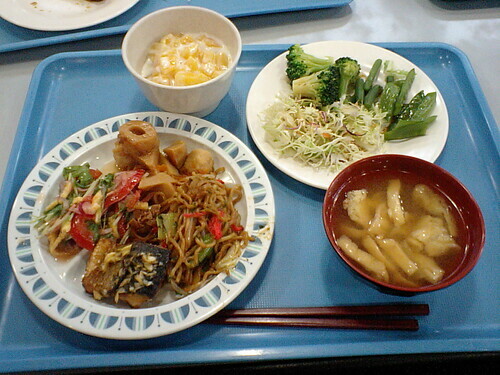 From plate on left: marinated tomato, mitsuba greens and thinly sliced omelet; nimono (braised dish) of chikuwa (grilled fish paste), takenoko (bamboo shoots) and sato imo (taro potato); yakisoba (fried noodles) and fried mackerel; dessert of yogurt and canned peaches; salad; and miso soup with cabbage and abura-age (fried tofu). 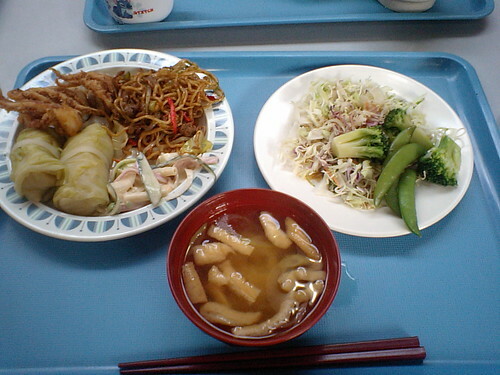 From plate on left: fried squid tentacles; yakisoba; macaroni salad; cabbage rolls; miso soup with abura-age; and salad. 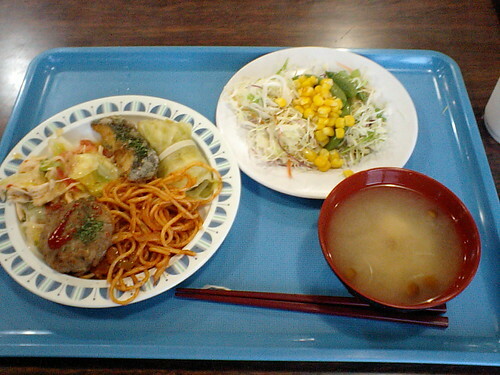 From plate on left: chicken and lettuce salad; fried fish; rolled cabbage; napolitan spaghetti; hamburg steak; green salad; miso soup with nameko mushrooms. From plate on left: green salad; marinated harusame (glass noodles) with ham, wakame seaweed and thinly sliced omelet; ramen; curry rice. On outings we had bento (lunch boxes) made for us. I ate the prettily packaged one above for four weeks. 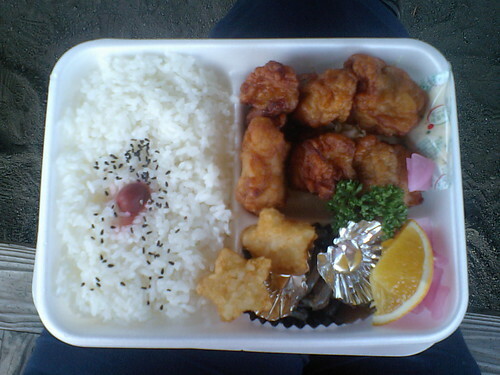 Inside was white rice topped with karikari-ume (crunchy pickled plum) and black sesame seeds; six pieces of kara-age (Japanese style fried chicken); star-shaped tater-tots; some kind of vegetables below the taters; a slice of orange, and pickled daikon. It was delicious the first time but less so the fourth, and I never thought I'd say this but I'd be happy if I never had cold fried chicken again. 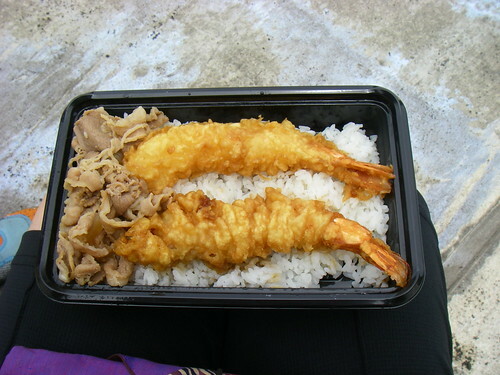 Rice topped with thinly sliced beef and two giant tempura shrimp. Oh wait, I think the beef was gyuudon style (cooked with onion and flavoured with dashi and soy sauce), so there might have been a few molecules of onion. This was actually really tasty but left me feeling dirty and ashamed. In September we were invited back to Kushiro (I'll blog about that soon) and came back loaded down with more Hokkaido souvenirs. 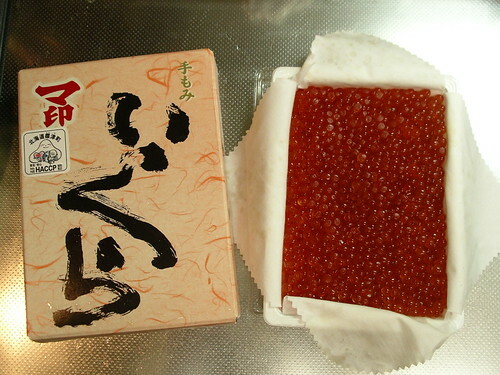 We got two types of ikura: shoyuzuke (cured in soy sauce) and shiozuke, shown above. 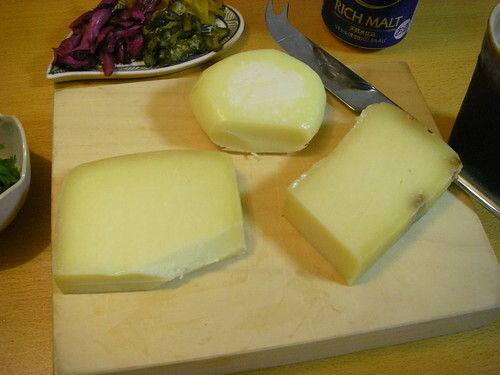 The shiozuke was unlike anything we'd tried before: it was dry, very firm, and had a very clean but strong flavour. It was even wrapped up in cotton fabric, presumably to absorb any excess liquid. The shoyuzuke was easy to serve, since it naturally goes well with rice. Above: potatoes with butter and miso; flaked Hokkaido salmon; yakinasu (grilled eggplant) topped with katsuobushi; komatsuna greens flavoured with soy sauce and sesame seeds; miso soup with tofu and myoga (ginger buds); and ikuradon (rice topped with ikura and nori seaweed). 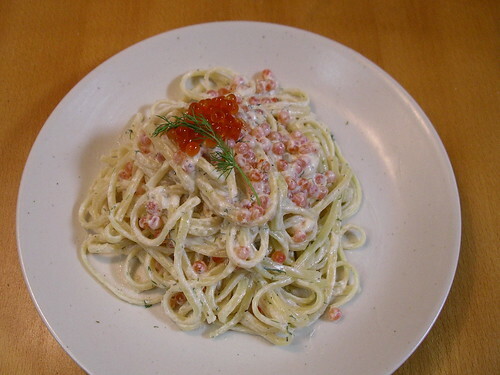 Thinking the shiozuke ikura might go better with western style cooking, I made Lemon and Salmon Roe Pasta, another Epicurious recipe as a special dinner for my birthday. I don't make cream sauces often so I stuck exactly to the recipe, and while it was good I think it was designed for people who don't really like salmon roe, as the lemon completely overwhelmed the roe. It was a nice idea though, and the dill went really nicely with the ikura, so I'd make it again without the lemon. 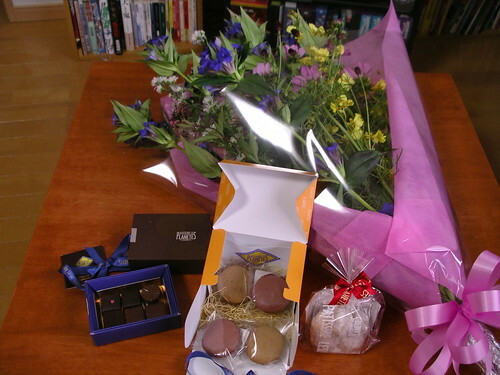 On my birthday Hideaki surprised me with flowers and sweets from Planetes, our local cake shop. He really shouldn't have--just cooking me dinner would have been enough (and he did cook dinner, of course--gyoza), but I didn't mind at all. From left: assorted chocolates, coffee and chocolate macarons, and almond snowballs (perhaps my all-time favourite cookie). 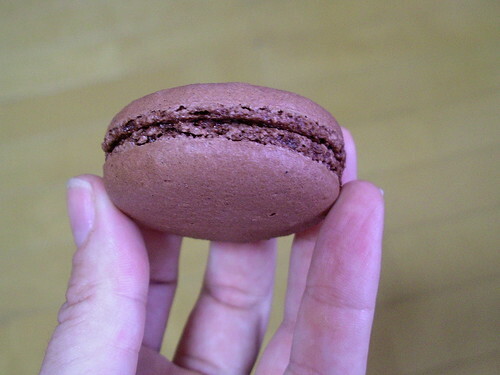 I had meant to lovingly photograph everything before eating but only managed to snap the chocolate macaron. This had a very good shell-to-filling ratio and the perfect texture, slightly crisp on the outside, slightly chewy on the inside. I could have eaten a dozen of these. 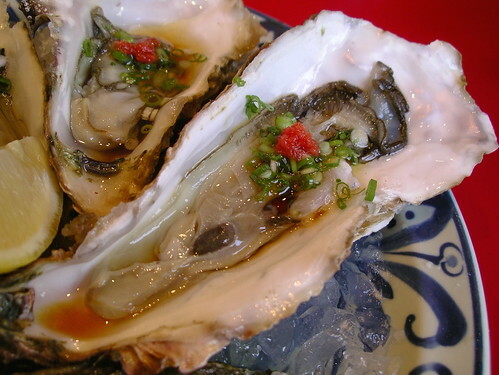 This is the first time I've visited when they've had raw oysters on the menu since I fell in love with them in Kushiro this spring. I used to only be able to eat them cooked, and we'd often order them at Marufuku deep-fried, but this time I just had to have them raw. They were from Miyagi in northern Japan and were huge, but cost just 100 yen each. They came topped with negi, momiji oroshi (grated daikon and hot chili pepper) and splash of rice vinegar and soy sauce, and I was a bit nervous because I'd previously only had them in Hokkaido, perfectly plain, and I was worried that maybe I only liked that particular kind of oysters or wouldn't like them with fancy toppings. But they were delicious. Quite different from the Akkeshi oysters I'd had in Hokkaido, but lovely in their own way, and really elevated by the toppings. These five were gone in no time and I was tempted to order more, until I realized I was getting full--these were actually big enough to be filling. 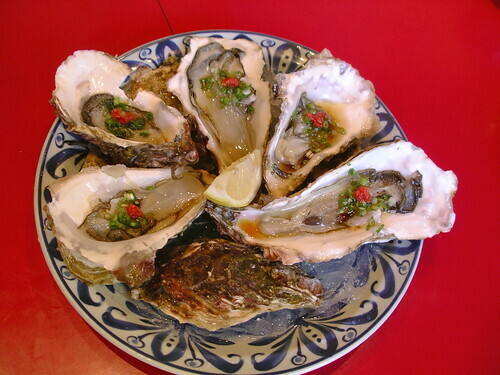 I'm looking forward to long life of oyster eating, and it's great to know I can find such cheap and tasty ones right here in my neighborhood. Hi there, I'm a lurker who's really happy to see you posting again -- especially such drool-worthy photos and descriptions! Wow. 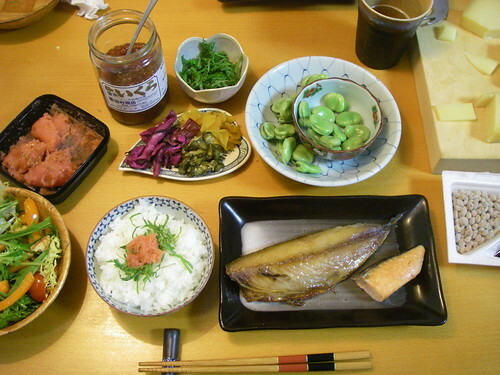 Glad you're blogging again; and what a host of meals, many surprising and some quite wonderful - I know that by Japanese standards you had a relatively simple summer, but from northern England everything looks incredibly imaginative. I eat dinner at your blog tables every day...at midnight my time. Thanks for feeding us Amy! Hello Amy! I have a question. Can you please tell me how to buy cooking sake? I've always wanted to try to recreate the meals you blog about but I don't have sake, and not sure what to look for here in Canada. Any tips would be great. Thanks! Happy (belated) Birthday! I love reading your blog - you always have such delicious food to post about, and great adventures! All of this seafood has my mouth watering. 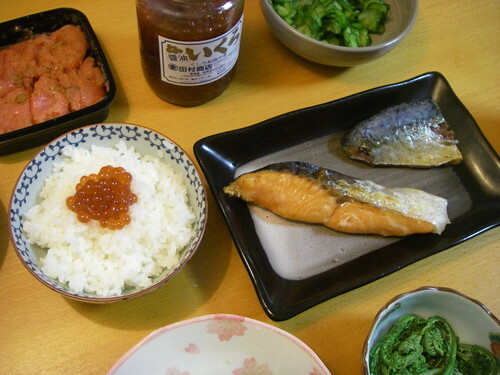 I want to eat ikura-gohan, misoshiru, and tsukemono for the next several days! Thank you for your sumptuous photographs -- they, and you, do Japanese cuisine proud. Wow! Everything looks so delicious and very tempting! Those foods are something new to my eyes and I am hoping I can try these all one day! Whenever I make Japanese food it always ends up looking horrible! Kudos to you for making such good looking food. In your first paragraph, you wrote, "...and he came back a few days later he was loaded down with souvenirs..." I think you meant to start that out with "and when he came back". 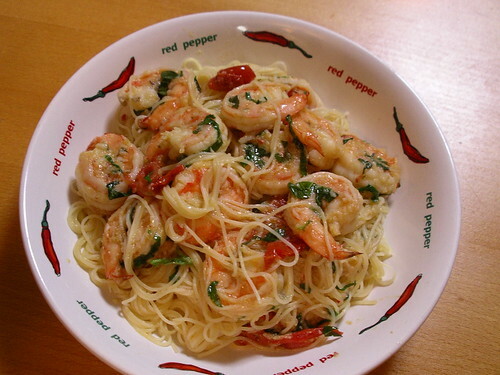 I'm 90 percent sure on this one... Underneath the garlic shrimp picture, you wrote, "...way too much sauce leftover..." I'm pretty sure that should be "left over". Wendy, that depends on how often you cook Japanese food, and whether or not you're a drinker. I prefer to use real sake to cooking sake, as it tastes better. I usually buy cheaper boxed sake, and if you plan on cooking Japanese regularly I recommend that if you can find it (I think Gekkeikan fits the bill and is widely available). If you don't intend to cook Japanese often then go ahead and buy a small bottle of good stuff, and drink up what you don't use in cooking. I'd only recommend cooking sake (comes in plastic bottles, sold at Japanese/Asian markets) if you can't find either. Depending on the dish, you can sub dry white wine or even sherry or Chinese cooking wine. Thanks for the blog award Fatima! I will try to follow up soon. Chris, thanks a lot for pointing those out! I'm horrible at proofreading my own writing, I wish people would mention my typos more often. The unknown watercress like greens are in fact fiddlehead ferns, so called because they look like the head of a fiddle. They are the immature shoots and very yummy.